"I hear no objections, it is so decided," Jan Pronk, president of the meeting, said in obvious relief as he brought down the gavel at the resumed session of the sixth conference of parties to the climate change convention. The meeting, held in Bonn from July 16-27, 2001, outlined details on how to implement the Kyoto Protocol, aimed at reducing greenhouse gas ( ghg ) emissions in industrialised countries. The protocol calls for a 5.2 per cent reduction of ghg emissions from 1990 levels by 2008-2012. This already weak target was further weakened by some of the decisions taken at Bonn. 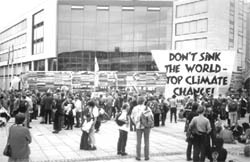 Despite this, the Bonn agreement was praised by some as a triumph of multilateralism over unilateralism. The Bonn meeting can be described as an exercise in maintaining quorum for the Kyoto Protocol to come into effect. After the us rejected it in March 2001, the agreement seemed doomed. To come into force, it has to be ratified by industrialised countries responsible for at least 55 per cent of the total industrialised country emissions in 1990. The us accounts for 36 per cent. After it announced that it would not ratify, Russia, Japan, Canada and Australia were catapulted to a pivotal position. To come into effect without the us , the protocol needs Russia, which has a 17.4 per cent share in 1990 emissions. In addition, it needs ratification by either Japan, or Canada and Australia together. Realising they had a key role to play, these countries used the situation to their advantage, demanding (and getting) huge concessions. The eu , which had pushed to ensure the environmental integrity of the protocol at the previous meeting held in The Hague in November 2000, softened its stand to keep the protocol alive and -- according to some -- to score points over the us . "An existing deal is better than no deal," opined Olivier Deleuze, Belgium environment minister, defending the eu decision of saying yes at Bonn after rejecting a similar environmentally unsound deal at The Hague. Pronk proposes When the conference started on July 16, 2001, there was little hope of any substantial decisions being taken at Bonn. However, Pronk was bent upon getting an agreement while he was still president. On the evening of July 21, 2001, he tabled a proposal dealing with the four 'crunch' issues that had prevented agreement in the past -- finance, mechanisms, sinks and compliance. "Minister Pronk made it clear that his proposal does not represent a platform for new negotiations on details," German environment minister Jrgen Trittin told the media. "In principle he is only presenting the delegations of the parties (countries) with the option of accepting or rejecting this proposal." He also announced that the eu considered the proposal a "hard compromise" but was willing to accept it without any amendments if other countries also accept it without any changes. But the proposal was not acceptable to g 77 and China, although they considered it as a good basis for further negotiations, and the umbrella group (Japan, Canada, Australia, New Zealand, Norway and Iceland), which was unhappy with the sections on finance and compliance. They opposed punitive and binding consequences on an industrialised country, if it failed to meet its commitments under the protocol. Eventually, New Zealand, Norway and Iceland agreed to the proposal in its existing form, but Japan, Canada and Australia stood their ground. Pronk proposed opening the section on compliance for amendments.This invited a spate of remarks from g 77 and China demanding opening discussions on other issues as well. "It is a guarantee for failure.... There would not be one, two, three or four amendments but 200-300 amendments. That would be unmanageable," said Pronk as he strongly rejected such suggestions. In the absence of a compromise, he offered to table the proposal in the plenary meeting for adoption as it stood. It later became clear, however, that only the compliance provisions were changed, while the g 77 and China was not given a chance to propose their changes. After negotiating through the night on compliance, word got around that agreement was reached. Pronk got a standing ovation from bleary-eyed participants when he announced that his proposal, with changes to the text on compliance, would form the political agreement. Compliance turned out to be the issue that almost prevented a deal at Bonn. Countries finally gave in to Japan, Canada and Australia, producing a weak compliance mechanism with no clarity on its legally binding nature. All references to financial penalties and repairing damage caused to the environment were deleted to make the mechanism palatable to the three countries. It was decided to have a compliance committee with two branches. The enforcement branch will prescribe 'restorative' consequences if countries default on their obligations. In case an indutrialised country emits more than the amount allowed by the protocol in the first commitment period, it will be able to borrow from its assigned amount for the second commitment period at a rate of one is to three. For instance, if a country exceeds its assigned amount by one tonne of carbon, the assigned amount in the next commitment period will be reduced by three tonnes of carbon. According to the agreement, restorative consequences ensure environmental integrity since they require countries to compensate for their excesses by emitting smaller quantities in the future. Scientifically, the damage caused by emitting one tonne of carbon today cannot be compensated by not emitting three tonnes of carbon in the future. The penalty rate of one is to three does not have scientific reasoning as its basis -- instead, it is a result of political give and take. Although even punitive consequences do not ensure that the damage will be fully repaired, they provide a stronger deterrent against non-compliance. In addition, the defaulting country will have to develop an action plan explaining how it aims to correct its default, giving priority to domestic policies and measures. The plan will be assessed and reviewed by the enforcement branch. The defaulting country will not be allowed to participate in emissions trading. There is no mention of these consequences being legally binding, with the result that till the end of the meeting, there was no clarity on whether the compliance mechanism was binding on countries or not. While a group of industrialised countries maintained that the compliance mechanism was not legally binding, another group felt that this issue was left open for further discussions. According to the Kyoto Protocol, the conference of parties serving as the meeting of parties ( c o p / m o p ) should approve procedures and mechanisms on compliance at its first session, and that any procedure entailing binding consequences should be adopted by means of an amendment to the protocol. The agreement, however, only recommends adoption by c o p / m o p at its first session, instead of adoption as an amendment. l included additional information needed to ensure compliance with emissions reduction objectives in their annual inventory of emissions of ghgs and their absorption by sinks. An industrialised country can appeal to cop / mop against the enforcement branch's final decision relating to compliance with emission reduction commitments. However, a three-quarters majority in cop / mop will be required to override decisions of the branch. The facilitative branch will be responsible for assisting countries in complying with these three obligations, but its scope includes developing countries as well. This branch will promote compliance by warning countries of their potential default at the earliest. Each branch will be composed of one member each from the five un regional groups, one from small island developing states (sids), and two each from industrialised and developing countries. The two branches will take decisions by consensus, failing which a majority of three-quarters will be needed. In addition to a three-quarters majority, the enforcement branch will also require a majority of both, industrialised and developing countries, to pass a decision. Discussions on the issue will continue in Morocco at the seventh conference of parties (cop-7). Personal sinks In the Kyoto Protocol, article 3.3 and 3.4 deal with the role of land use, land use change and forestry (lulucf) activities to meet emission reduction commitments. Article 3.3 allows countries to account for sequestered carbon dioxide due to afforestation, reforestation and deforestation (ard) activities. Article 3.4 accounts for carbon dioxide sequestered due to forest, cropland and grazing land management, and revegetation. g 77 and China did not want credits for anything apart from ard activities to be included for the first commitment period. However, the Bonn agreement considers forest, cropland and grazing land management, and revegetation as eligible activities under article 3.4. Credits from agricultural activities including cropland and grazing land management, and revegetation will be fully counted. Credits for forest management, however, will be given in two steps. Step 1: An industrialised country will be allowed full credits for forest management up to a level equal to its 'debit' under article 3.3 but not greater than 8.2 million tonnes of carbon per year (mtC/year). This 'debit' equals the amount of carbon dioxide released due to deforestation minus the carbon dioxide removed by afforestation and reforestation -- in other words the total amount released due to ard activities. For instance, a country reports a debit of 5 mtC/year under article 3.3. But it has sequestered 20 mtC/year because of forest management. It will then be allowed credit of 5 mtC/year for forest management. If the same country had reported a debit of 9 mtC/year, it would have been allowed to fully count only 8.2 mtC/year (the limit) from 20 mtC/year towards meeting its reduction commitments. Step 2: After applying step 1, industrialised countries can count a certain number of tonnes of carbon dioxide stored in managed forests to meet commitments. The agreement specifies individual limits for different countries, arrived at by applying a 85 per cent discount factor and a 3 per cent cap on credits from forest management. Therefore, a country can take credits equal to this limit over and above what it availed in step 1. This provision is a complete give away to Japan, Canada and Australia, which presented a similar proposal advocating country by country caps. The agreement "corresponds fully to the wishes of Japan, and, in fact, goes beyond the wishes of Canada," remarked Trittin. As per the agreement, Japan is allowed credits for at most 13 mtC/year in step 2, while Canada's limit is 12 mtC/year. Russia can avail the largest amount of credits equal to 17.63 mtC/year in this step. Calculations show that these figures will allow Japan to increase its emissions by about 7.3 per cent over 1990 levels. Under the protocol, it was required to reduce emissions to 6 per cent below 1990 levels in 2008-2012. Thus, the effective target, after including sinks, changes to stabilisation at about 1.3 per cent over 1990 levels in 2008-2012. Similarly, the targets for Canada and Russia transform to stabilising at about 10 per cent and 4 per cent over 1990 levels in 2008-2012, respectively. Though the us decided to remain out of the discussions on this issue, its limit is calculated to be 28 mtC/year. An industrialised country can choose to apply any or all of these activities in the first commitment period, but will have to make this choice before 2008. Moreover, the industrialised country will have to show that these activities have occurred since 1990 and are human-induced in order to avail credits for them. g77 and China heavily compromised on long-standing demands related to the issue of finance. The end result does not provide any assurance that developing countries will eventually get any funds from the North for their adaptation and other needs. An earlier negotiating text earmarked a small, but definite amount of us $1 billion annually by 2005 for adaptation, technology transfer and capacity building activities in developing countries. Industrialised countries were to contribute to this amount in direct proportion to their share in total emissions in 1990. This figure was removed at the insistence of industrialised countries, who were afraid that they would have to pay the us' share since it had left the protocol. The Bonn agreement merely notes that industrialised countries will commit themselves to a specific amount through political declarations. Additionally, these contributions are not mandatory, and do not attract any kind of consequences if not met. The eu , with Canada, Iceland, New Zealand, Norway and Switzerland declared to collectively contribute us $410 million annually by 2005, with a provision to review the amount in 2008. Japan will annually provide about us $2.4 billion as concessional loans for projects related to climate change in developing countries. It also declared that it had provided financial and technical assistance amounting to us $7.4 billion for climate change projects since 1998. Industrialised countries have commitments to pay developing countries for adaptation under both the UN Framework Convention on Climate Change (FCCC) and the Kyoto Protocol. At the Bonn meeting, the us wanted obligations under FCCC and the protocol separated, so that it would not have to pay whatever was committed under the protocol. G77 and China also wanted a clear distinction on this. The EU, however, felt that such a separation placed a greater demand on it since the US, one of the biggest emitters of GHGS, was not required to pay anything under the protocol. The agreement separates the two and asks industrialised countries to annually report their financial contributions under both FCC and the protocol. Funding under FCCC: A special climate change fund and a separate fund for adaptation programmes in least developed countries (LDCs) is established under FCCC. The special climate change fund will finance measures for adaptation, technology transfer, and economic diversification. Projects in areas of energy, transport, industry, agriculture, forestry and waste management will also be financed by this fund. The agreement recognises that funds provided under FCCC should be new and additional to those already being provided by Global Environment Facility (GEF), and through multilateral and bilateral channels. • cooperating with developing countries in the technological development of non-energy uses of fossil fuels; development, diffusion and transfer of less GHG emitting advanced fossil fuel technologies, and fossil fuel technologies to capture and store ghgs. The legal text on financial issues was the only one to be completed at the Bonn meeting.